In the USA, government laws encourage zero-energy buildings in particular, and there will be a time when the trend becomes common in India as well. A large percentage of electricity / HVAC usage happens in buildings. Hence it is not only necessary to create energy from renewable sources but to also use it efficiently. This project aims to evaluate BITS Pilani's library as a sample digitally and tries to apply the principles of ZEBs (Zero Energy Buildings) to it. At the heart of the project is the belief that renewable energy concepts can be integrated with the way buildings are created. I worked in a small team of undergrad students which was led by current CEO of Techture, Viraj Voditel. A zero-energy building, also known as a zero net energy (ZNE) building, net-zero energy building (NZEB), or net zero building, is a building with zero net energy consumption. This signifies that the total amount of energy used by the building on an annual basis is roughly equal to the amount of renewable energy created on the site, or in other definitions by renewable energy sources elsewhere. These buildings consequently contribute less overall greenhouse gas to the atmosphere than similar non-ZNE buildings. We used a diverse variety of sustainability concepts to analyze the library. Passive and active solar studies, wind simulation and material variation were amongst the ones majorly used. The project involved the use Autodesk Ecotect Analysis 2013 and Autodesk Project Vasari as 3D modeling software that helped us in analyzing for zero energy concepts. Using the power of these 2 software, a case study of the “BITS Library” was implemented on the codes defined by LEED (Leadership in Energy and Environmental Design) for ZEBs. Details needed for sun pattern analysis fed into Vasari. We analyzed via a multi-day study from August to Dec 2012. 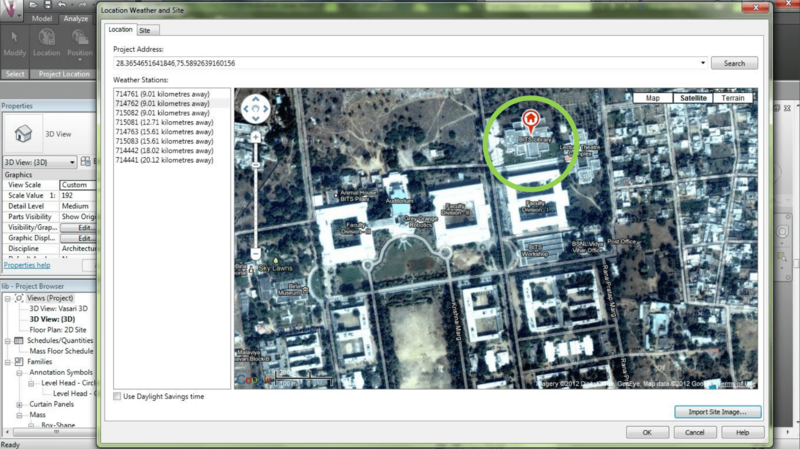 Sun path over the BITS Pilani library from Aug to Dec 2012. This helped us understand the sun’s position throughout the day and year. 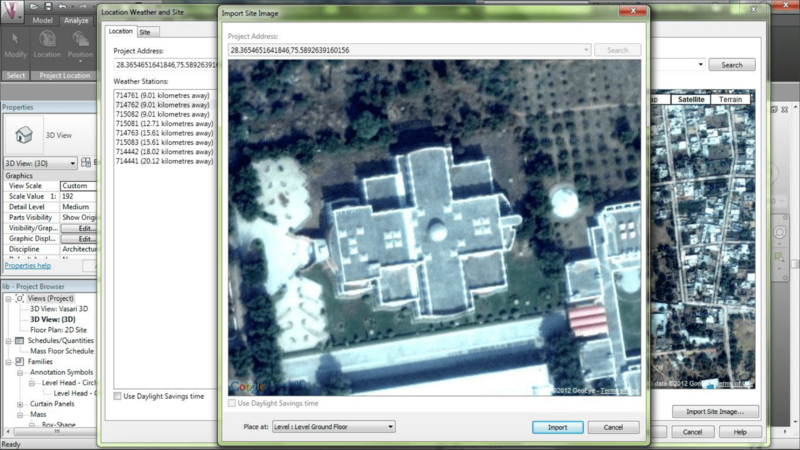 Final incident solar radiation analysis seen from different isometric viewpoints. 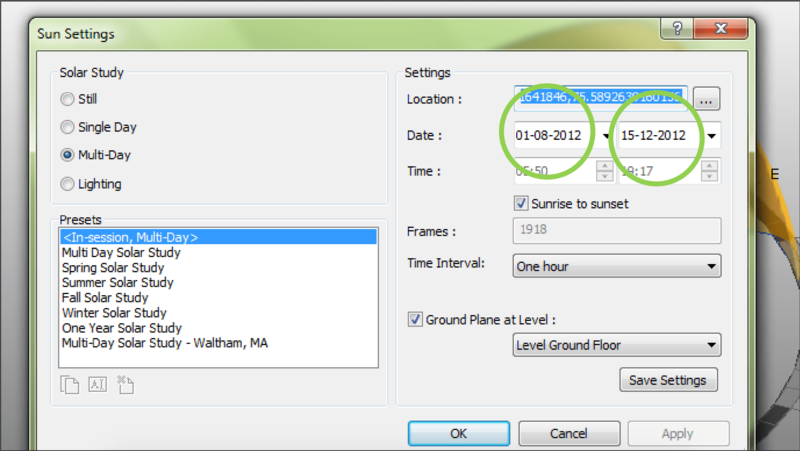 We get to know how much solar radiation is the building receiving at certain times of the day and year. The blue zones receive relatively less sunlight than the yellow ones. Red zones are overheated. This helps in orienting and mass the building. A wind-rose is a graphic tool used by meteorologists to give a succinct view of how wind speed and direction are typically distributed at a particular location. The wind-rose chart shows the distribution of wind speed, wind direction and relative frequency for a given date and time range. The chart comprises 16 angular wedges, each representing an arc of 22.5° around the entire circle. The overall radius of each wedge represented the percentage of time that the wind came from that direction during the calculation period. Each wedge contains 8 different colored segments. The color of each segment represents the speed of the wind when it was coming from that direction, as shown in the legend immediately to the right of the chart. The radius of each colored segment (and therefore its size) shows the relative percentage of time that the wind from that direction was within that speed range. 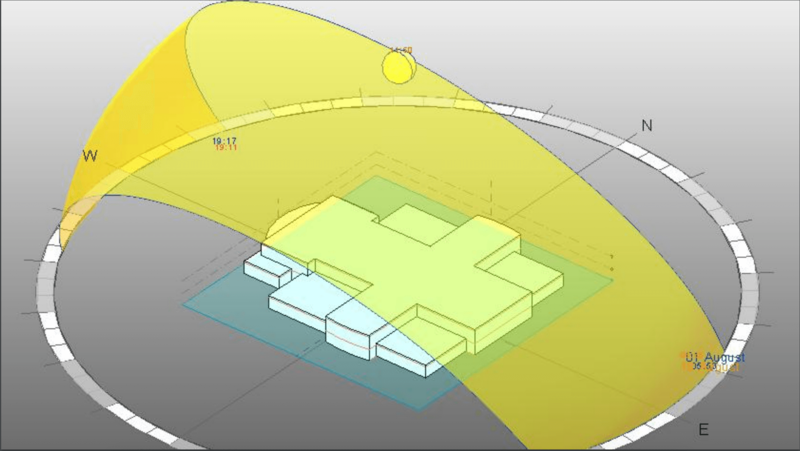 Predicting natural wind flow paths and thus helping in planning cross-ventilation outlets. 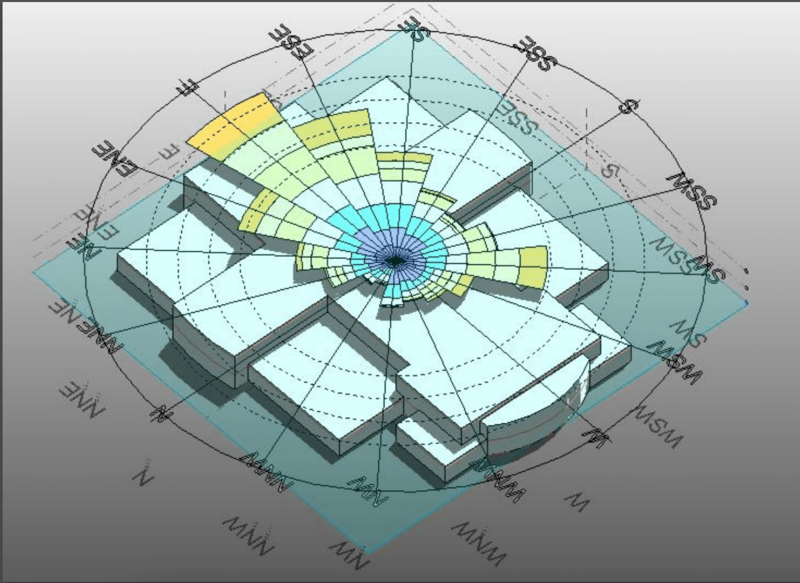 wind-rose diagram superimposed over the library model to create wind tunnel flows. A report was generated from the Autodesk tool giving us with usage results and renewable energy potential of the library. This report was fed into a software called RETScreen. This handy tool provides us with the appropriate and effective renewable energy sources which could be used. These were provided as suggestions to the college administration during the reconstruction and remodeling of the college campus. Renewable energy is the future. However, with the decreasing available area for installing these technologies (like large wind or solar farms), an alternative needs to be devised. A solution for this is to incorporate renewable technologies into our infrastructure and making the structures environmentally sound hence reducing their carbon footprint.